Arkwright was one of 13 children born to Sarah and Thomas, a tailor in Preston, Lancashire. With so many siblings there was no opportunity for the boy to undertake formal education but Arkwright was fortunate enough to have a cousin who could read and write, and she passed on these vital skills to him. The man who would make a fortune in the mills began his career as a barber and wigmaker, apprenticed first to Mr Nicholson and then the proud proprietor of his own establishment at Churchgate in Bolton, opened when he was just 20 years of age. Arkwright's clients were the gentlemen who made Bolton into a town of industrial might and they demanded the best of everything, so to have the Lancashire drizzle wash the expensive dye from their periwigs was hardly a recipe for customer satisfaction. Whilst re-dying his client's wigs Arkwright realised that there was an opportunity for innovation at hand and he laboured to produce a dye that was waterproof, turning his shop into the go-to place for the latest in wig innovation. Sensing an opportunity for speculation he took to the roads of England, collecting discarded human hair and turning it into fashionable, waterproof wigs using his secret dying method. However, the fashion for wigs was not going to last forever, and when it began to fade the would-be entrepreneur already had his next venture in mind. Growing up in Bolton in a tailor's household, Arkwright had spent his childhood surrounded by textile mills and workers, and he knew of the arduous task of running the machinery that transformed raw cotton into thread, a laborious and strung-out process. With his thirst for invention unquenched and well aware that the passionate millworkers of his hometown would not take kindly to innovations that would help the owners but possibly cost them their jobs, the young wigmaker followed the textile trail to its centre in Nottingham. Here he worked alongside clockmaker John Kay to develop and patent the spinning frame (later the water frame), a machine that could produce yarn at a fraction of the cost and a much faster speed than human workers. Arkwright's name and reputation began to spread through the textile producers of England and the factory he opened with new partner John Smalley added yet another machine to its line, the groundbreaking carding engine. In need of expansion capital, Arkwright went into partnership with Jedediah Strutt and Samuel Need, who financed his innovations until a dispute over Arkwright's speedy expansion brought the partnership to an abrupt end. At a cost of more than £10,000 he completed the carding engine, perfecting and fully mechanising the process, yet as with so many tales of success, others were quick to follow his lead. The engine was patented in 1775 and his contemporaries rushed to copy Arkwright's innovations, eventually causing him to take legal measures to enforce his patent rights. Juggling court cases on one hand and business on the other, Arkwright opened a horse-driven mill in Preston and later became the first to use steam to power the waterwheel that fed the machinery. His Cromford Mill was a state of the art building, with Arkwright bringing in whole families to staff it and live in the newly-built cottages on site. Providing his millworkers with homes, holidays and social gathering places, he also pioneered the use of shift workers and was considered a fair and decent employer. All of this innovation came at a price and as the 1770s progressed, Arkwright found himself embroiled in ever more bitter legal disputes. 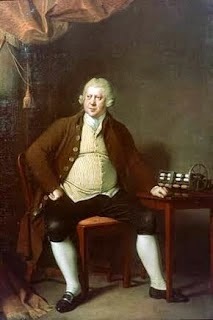 His patents of 1775 were subject to a decade-long series of challenges from inventors who claimed that Arkwright had based his own inventions on their work. As he faced these ruinously expensive cases Arkwright's factories were the subjects of industrial espionage as well as the ire of workers, terrified that the mills of the future would be staffed not by men, but by machines. However, Arkwright continued to innovate, and it was under his patronage that Birkacre Mill in Chorley was fully refitted, though it was destroyed by anti-machinery protesters in 1779. By 1785 the entrepreneur's patents had been overturned and many in the industry looked forward to what they hoped would be the downfall of an apparently egotistical, arrogant man. However, despite his fury that his professional integrity was in dispute, Arkwright was delighted to accept a knighthood in 1786 and the following year became High Sheriff of Derbyshire. Arkwright was a born entrepreneur; he made partnerships only when he had no other choice and as soon as the finances were in place, bought out his partners at the best rate possible. With an unshakable belief in his own abilities and talent, he had a canny business acumen that led him to amass a fortune. He employed tens of thousands of workers and licensed intellectual property rights to elements of his designs at keen rates, ensuring that even the smallest innovation was monetised at every opportunity. When Arkwright died in 1792 his son took over the business and inherited a fortune that some said was made on the backs of others. The self-made entrepreneur is memorialised across Britain to this day, his name synonymous with the very fabric of industrial England. My great grandmother was Ellen Arkwright and she claimed to be a descendant of Richard Arkwright although I haven't been able to verify it. I also believe that Arkwright got the design of the water frame by plying it's original inventor with drink! He was a shrewd business man. That's really fascinating; I wonder if she was? Do let us know if you're ever able to verify! Workers replaced by machines I suspect has gone on since a mammoth hunter found putting a stone on stick meant less people were needed to bring the beast down. Love your posts. "The spinning Jenny" was Arkwright's creation. The BBC production of Mrs. Gaskell's" North and South" is worth watching for its depiction of desperate mill workers, fear of automation, and the rise of the labor unions. Thanks you Catherine for wonderful posts today (and every day).